Disney stories and films (plus an enchanting visit to Disney World Florida) are entwined in many memories from my childhood. They evoke thoughts of the people I watched them with and the joy I had and still have in watching them. Winnie the Pooh, The Fox and the Hound, Honey I Shrunk The Kids, The Little Mermaid, Flight of The Navigator, Beauty and The Beast, Fantasia to name but a few. Then in later years Hocus Pocus, Cool Runnings, The Lion King, Finding Nemo and the Toy Story series. Really those titles are just the tip of the iceberg of Disney films that I love. Fast forward too many years for my liking, now as a parent I get to share my love of Disney with my children. From a young age they have been bewitched by Disney magic. Disney old and new has been embraced by us. 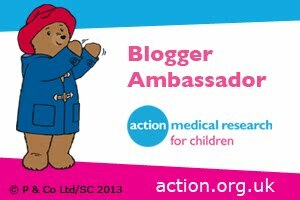 Whilst they love all Disney productions they do have a soft spot for the animated films. They watch Disney films countless times, know all the songs and fill the house with Disney clothing, books and toys. 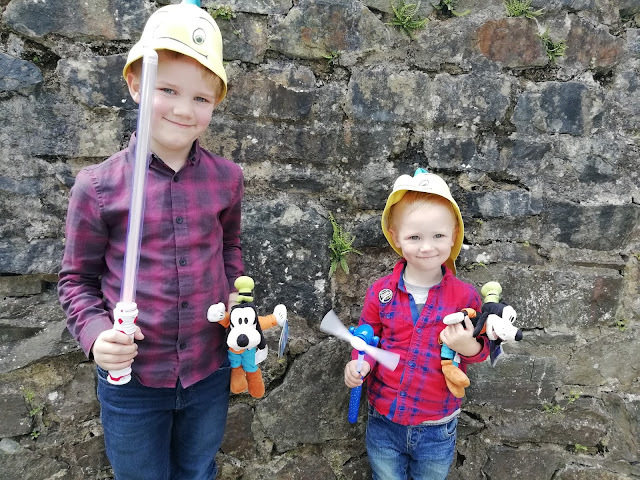 Naturally the boys have their favourite Disney films and characters but share a love for all things Disney. Bug loves Toy Story, Wreck It Ralph, Brave, Zootopia and Big Hero 6. Whilst Jelly Bean has been enchanted by Cars (Lightning McQueen superfan here! ), Finding Nemo and Moana. As they love Disney so much we took them to Disney On Ice 100 Years of Magic last year which they loved. 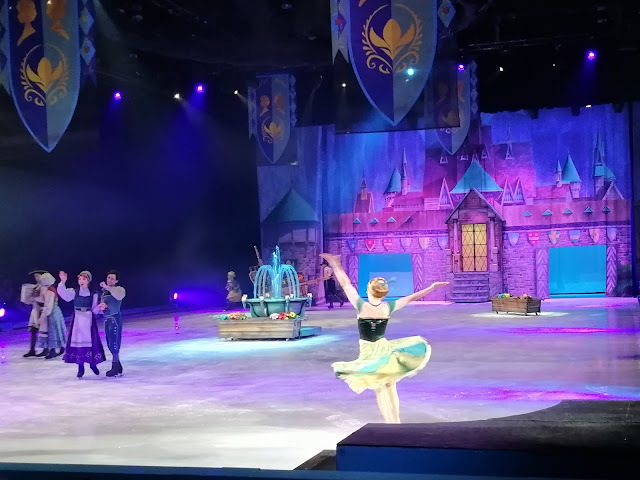 With them being enthralled by last years magical Disney ice show we decided to surprise them with another taste of Disney magic with a trip to see this years Disney On Ice Worlds Of Enchantment show at Motorpoint Arena in Cardiff. The format of the show was great. Hosts Mickey and his friends separated the Disney stories with brief schticks filled with their special charm and humour. Both halves of the show featured a longer version of a Disney story (condensed compared to the films) along with a shorter performance of another Disney story. 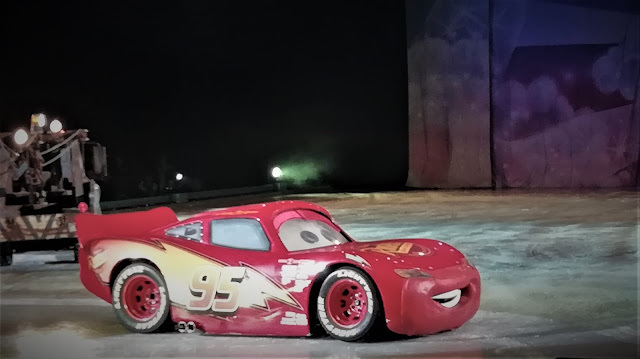 The first half featured Toy Story 3 and classic The Little Mermaid then the second half of the show featured Cars and Frozen. Throughout the whole show were musical numbers that entertained, delighted and created a joyful atmosphere. With most of the songs being from the hit films they were familiar and begged for the crowd to sing along….and they did just that! From the moment we entered the arena the boys were buzzing with excitement. 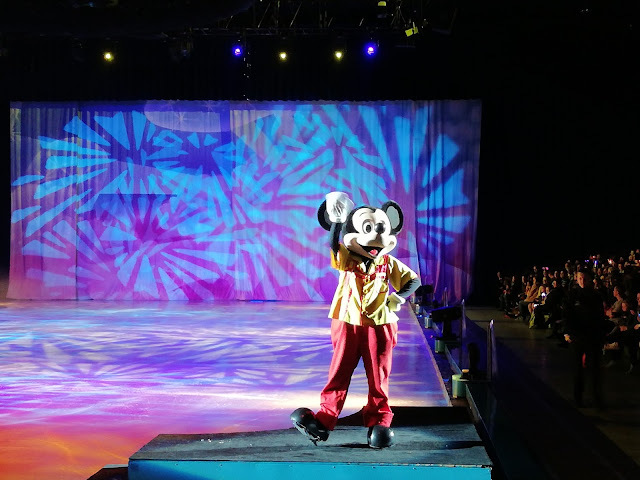 When the lights dimmed, the music started and the skaters came onto the ice for the Fit to Dance pre-show programme their faces were aglow with glee. 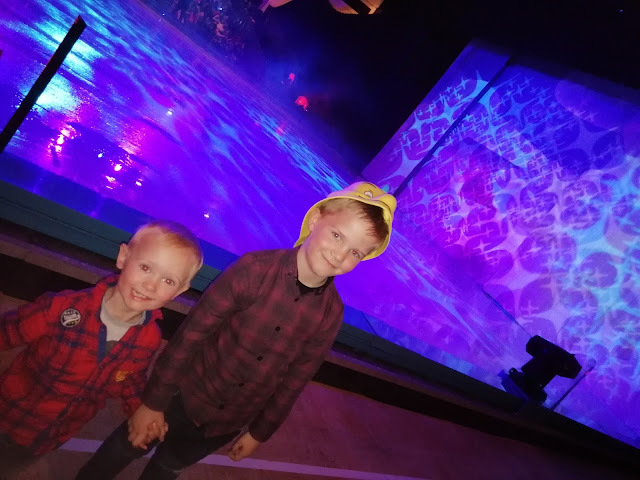 The boys bubbled with joyful anticipation of what was to come and were over the moon when the hosts of the show Mickey and his friends glided out to say hello and start the show. Giggles of joyfulness drifted up from the boys’ seats and from all around the arena as good old, beloved Goofy entertained with his unique eccentric, clumsy ways. After being entertained by renowned Mickey and his pals the first Disney tale started. Toy Story 3 started with a ‘wow’ and as they told the story of how Woody, Buzz and all the other beloved toys escaped from Sunnyside Daycare and the nasty Lotso the ‘wow’ moments came thick and fast. The skater who looked exactly like teenager Andy from the film, the Army man parachuting onto the ice, the amazing backdrop of 3D bedroom furniture, the lively children of Sunnyside Daycare looking gigantic and terrifying to the toys and the toys looking as if they had stepped straight out of the cinema screen - real, colourful and perfectly detailed to look exactly like the popular characters that we all know and love. The songs and music were perfect for the scenes and the choreography was sublime. Bug especially loved the dancing toy soldiers who were truly impressive. Following another humorous sketch by Mickey and his friends the show moved on to a pure classic Disney film - The Little Mermaid. Whilst it was not as long as the Toy Story 3 section it was very succinct with all of the major plot points of the film. The underwater scenes with Ariel, Flounder and Sebastian were colourful, vibrant and filled with fun. During the joyful song ‘Under the Sea’/’ VIP children from the crowd were lucky enough to ride on a fun submarine skating in between the talented skating sea creatures. Like the Toy Story 3 characters the Ariel ones looked like clones from the film. It was truly amazing to see how perfect and lifelike they were. The costumes were incredible, I loved Ursula. 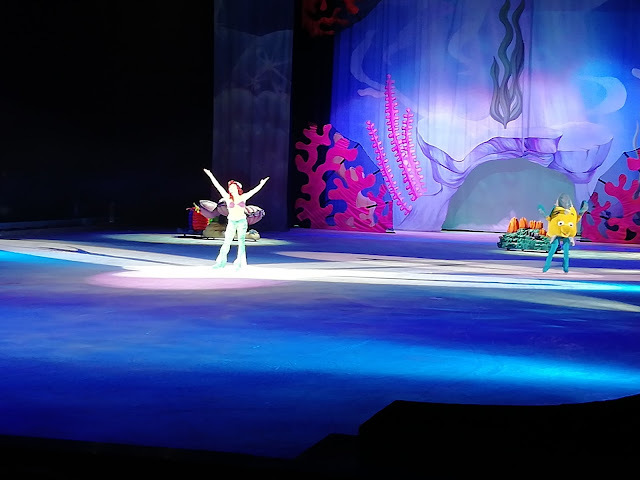 Not only did the music and costumes bring the world of Ariel to life but lighting and special effects such as bubbles raining down onto the stage provided the show with a 4D element making it even more special. I loved that they included an older classic Disney film in the show and not just more modern ones. In fact with it being one of my favourite Disney films when I was a child it evoked fond memories for me and was most probably my personal favourite part of the whole show. Following a welcome break to stretch legs, head for the toilet or grab a drink the show went on. In fact the second half of the show started with a ‘bang!’. 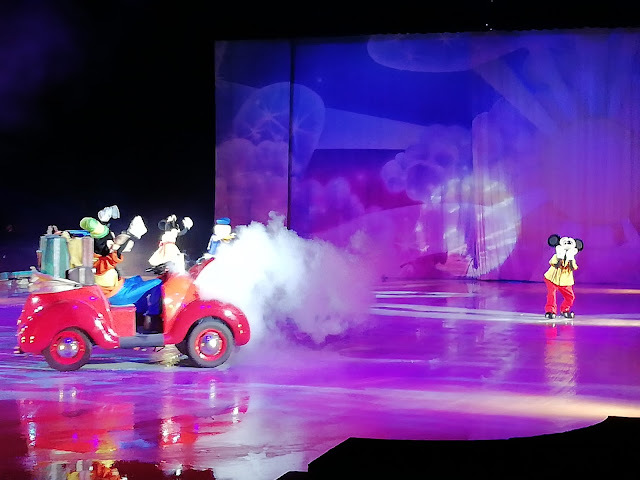 Mickey along with Minnie drove onto the stage in their adorable red car which broke down in a big cloud of smoke. 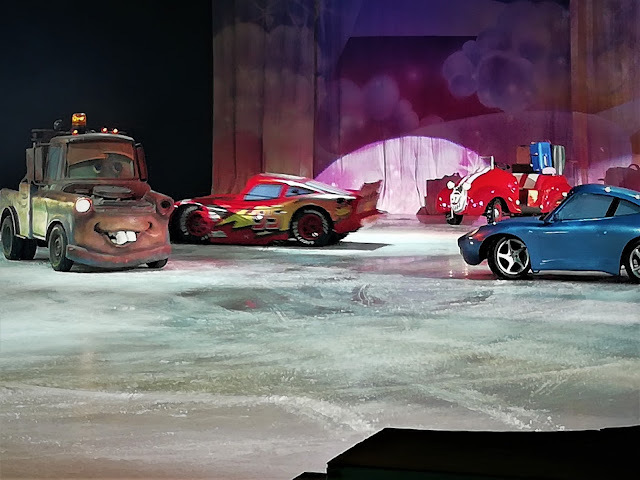 Leaving the car to go find help (good old Goofy did try his best to fix the car first) the ice stage became a racing track for the famous cars from Disney Pixar’s Cars film. Driving the cars on the ice was an impressive skill and seeing their favourite Cars characters driving around so close to us betwitched the boys. Seeing the wonder and amazement on their eyes as they watched Mater and Lighting McQueen drive around and talk with the same voices as the films was a delight to watch. As they were mesmerised by the Cars section of the show they would have loved for it to last that little bit longer however I can understand the logistics of driving cars on ice might hinder how much they can do and the length of a performance. Whilst they would have loved more Cars action, hearing the hit song ‘Life is a highway’ from the film and seeing the cars drive before their very eyes filled them with joy and unforgettable memories. Bringing the show to a dazzling finish was the hit Disney film Frozen. The performance covered key events from the film from the coronation to an act of true love when Elsa thawed Anna and Arendelle. Popular songs such as “Love is an open door” and “Let it Go” enchanted the audience who sang along with the stars of Frozen. 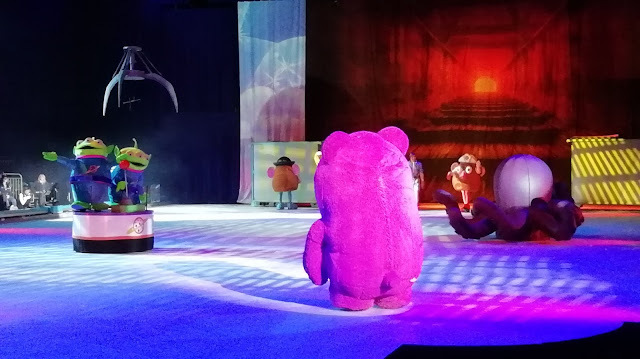 The excellent stage backdrops and props really transformed the ice stage to look like the different scenes from the film such as Arendelle kingdom. Also amazing were the costumes and it was remarkable that Elsa’s costume changed during the song “Let it Go” and how they depicted Anna getting frozen in the winter storm. 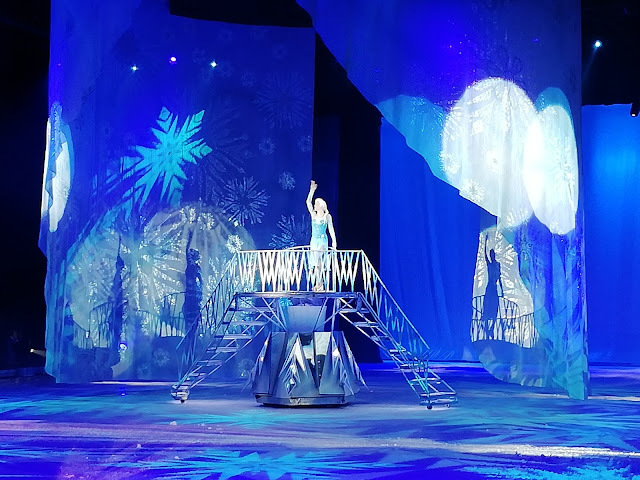 Special effects added to the magic of the Frozen performance such as lighting, fireworks, snow falling from the sky and Elsa’s ice palace created before our very eyes thanks to a extending platform bridge and a little help from some beautiful icy blue fabric which dropped down from the ceiling and surrounded Elsa as she sang her hit song. Featuring in the Frozen section was the beloved and very adorable Olaf. He added charm, humour and a splash of magic and fantasy. His costume was fabulous and the rendition of his popular song ‘In Summer’ was fun, colourful and uplifting. 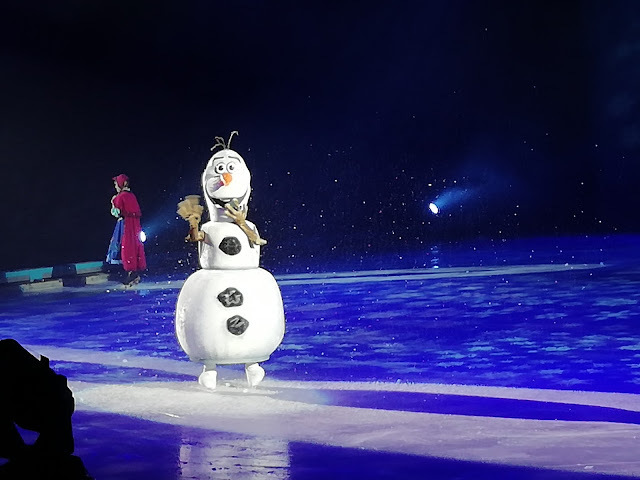 As Olaf was such a hit with my boys they were a little disappointed that Sven was not part of the show, as was I because the adorable reindeer is such a wonderful character from the film. Having seen how wonderful Bullseye from Toy Story 3 was I can imagine they would have been able to create an amazing Sven so it was a shame he was not part of the Frozen fun. Overall the show was truly remarkable. Breathtaking stunts, awe inspiring special effects, exciting songs and spectacular costumes. It was bewitching, inspiring and a must-see for Disney fans. The delicate balance of characters from Toy Story, Cars, Ariel and Frozen means the show appeals to all with something for everyone. 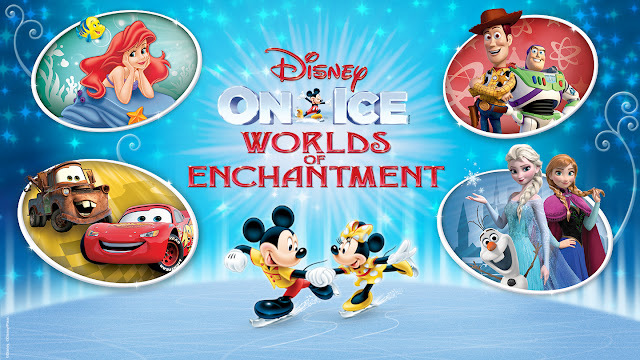 The beauty of Disney on Ice Worlds of Enchantment is that it brings the magic of Disney to life. 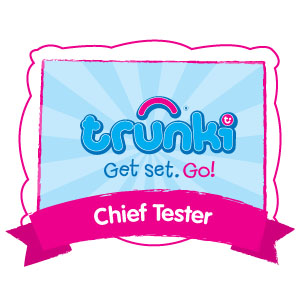 Toys can come to life and have adventures and two princesses can rock together showing us that girls can be heroes too. It sparks imagination - worlds of cars with characters and a mysterious underwater world with mermaids. Friendships, positivity, lessons learned, good triumphing over evil, love - romantic and sibling love, fun, self-acceptance and pride. We loved the show. 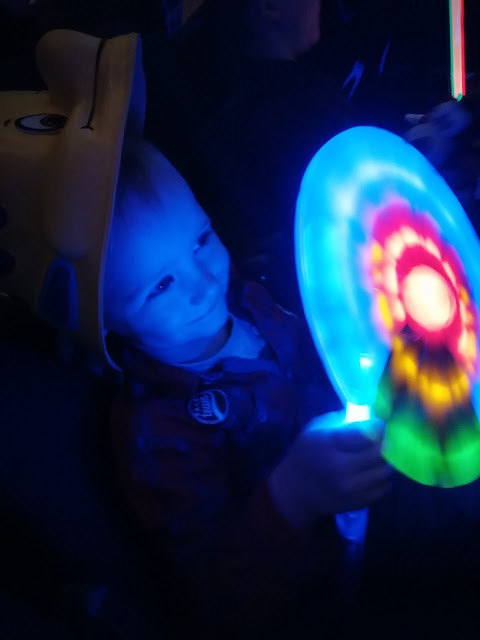 The boys were spellbound by the magic of it all and I was enchanted by seeing their eyes sparkle with awe, love and wonder. 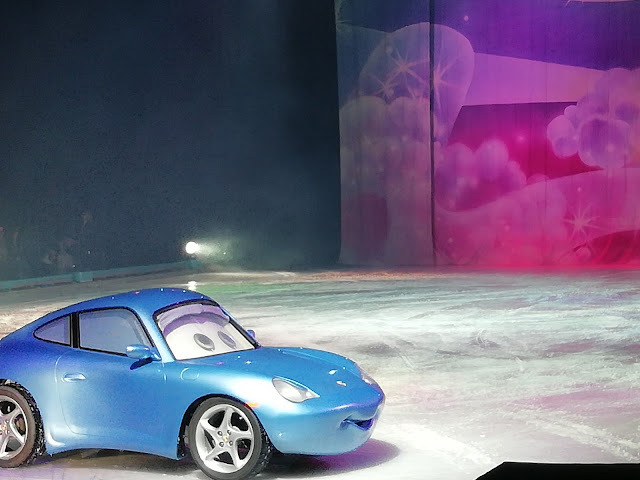 I cannot wait to see what magical offering Disney On Ice conjures up next. 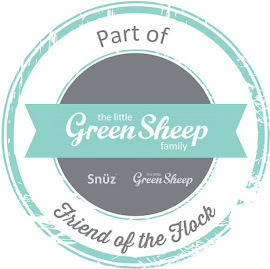 I have never been to one and want to take my grands so bad. The problem is the closest one is three hours away. Hoping to see it soon, so cute! 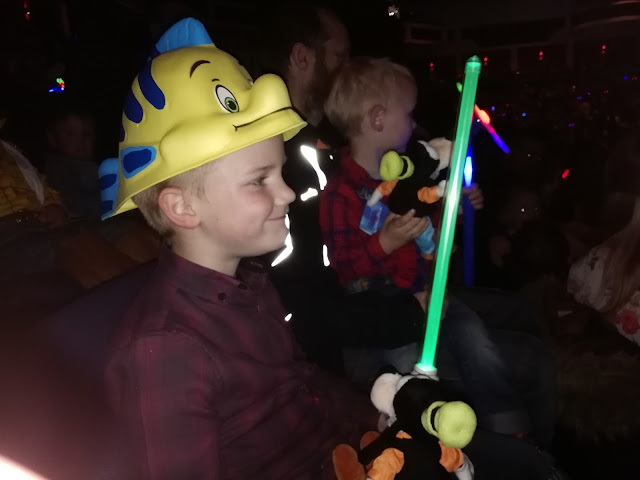 We've been to see Disney on Ice last month and thoroughly enjoyed every minute. It is such a great show. Wow, that looks incredible. Took my grandson to see Paw Patrol but this seems much more elaborate. Thank you for sharing. It seems like you all had a blast! I would love to see one show! What a great review. I would love to watch this sort of show with the kids. They are obsessed with McQueen. They love the car. I have seen and heard so many good things about DOI, especially the toy story part, looks amazing. Such an awesome show for Disney fans! Glad to know your kids enjoyed it. It's been one of my favorites ever since it started. 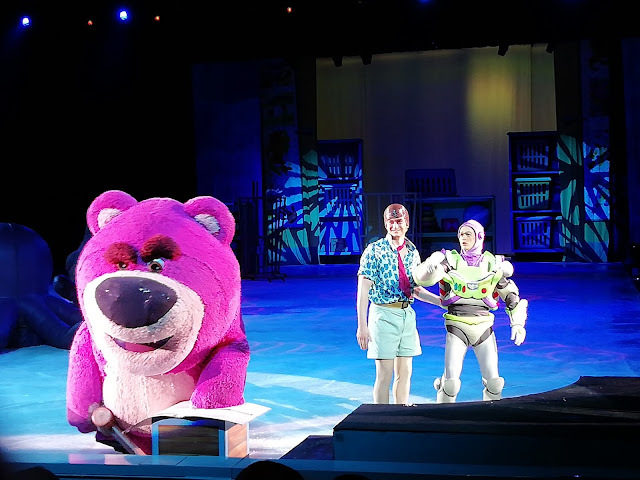 Disney on Ice is so entertaining! I love to figure skate although I am not any good at it. I hope my daughter will like it too so that I can take her to shows like this one! Disney sure knows how to make you feel young again and taken away into a far away fairy land. To be a child again! It looks like such an incredible show. I know my daughter and I have talked about going but we haven't been able to yet. It looks so awesome. This sounds amazing. Definitely one for the kids bucket list! 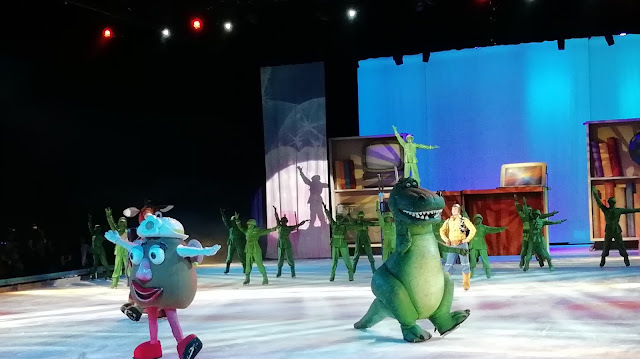 I have never been to a Disney on Ice show before. It looks very entertaining. Maybe when I have grandkids and when they are old enough I will take them to a show. 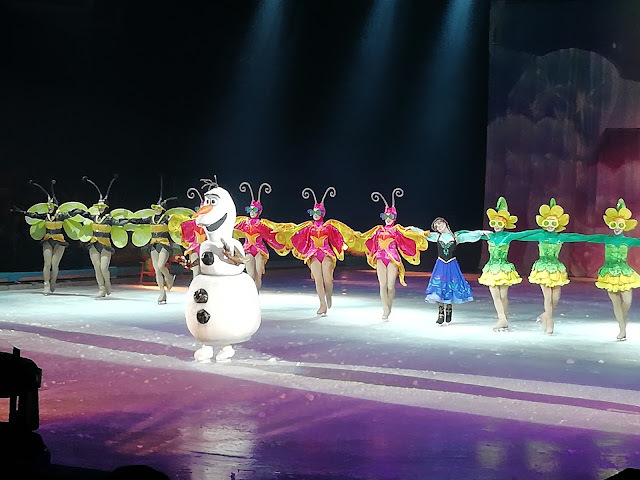 The Disney on ice is a wonderful show. 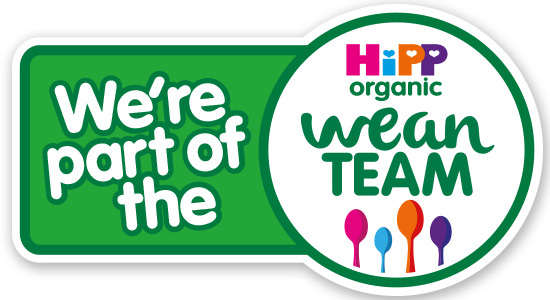 I led my kids and we were delighted! That sounds like a lovely day out - and so much fun. 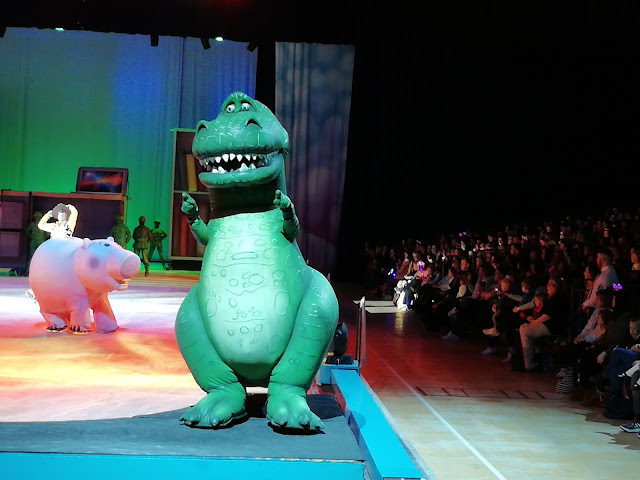 We've been to another ice show and I was surprised how entrancing even the adults found it! 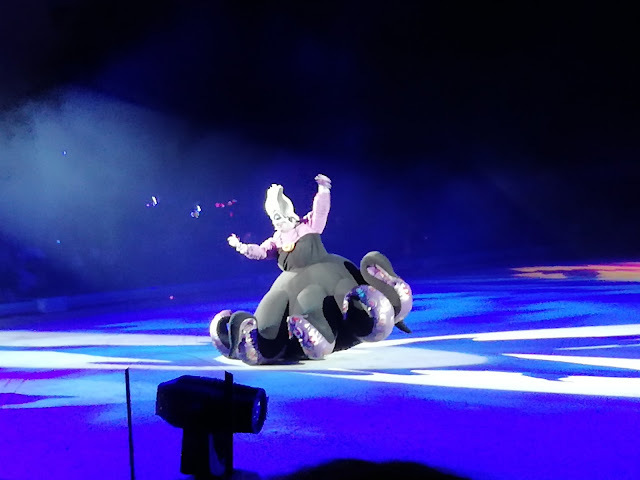 I love Disney on Ice - we\ve seen some amazing shows over the years but my two think they're too old for it all now! I think I'd love this more than my kids!